I’ve played through much of Final Fantasy III for DS (the original Japanese FF3, not the FF3 that’s really FF6), but I think I’ve reached a point where I have to take a break because it’s become more frustrating than fun. One of the annoying aspects of this game when compared to other FF games is that you can only save your game outside, and there aren’t any tents to restore hit points and magic power. Now that I’ve gotten to the Crystal Tower, there aren’t too many ways I can save at full health. I could go back to the Land of Eureka, but that’s a bit of a hassle. Or I could return to a town, but that would mean making my way through the Ancients’ Maze again. What I really want to talk about regarding FF3, however, is the job system. This is the first FF game to use one, and it’s rather primitive. 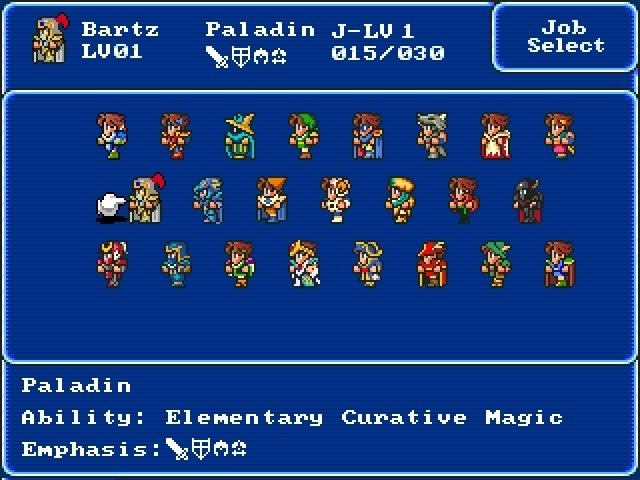 Basically, the job system means a character can switch at will to different role-playing classes, like knight, wizard, and martial artist. Changing classes means changing statistics as well, including the weapons, armor, magic spells, and battle commands you can use. The game is constructed so that particular jobs will be especially useful or useless at different times. What’s disappointing is that building up your prowess at a particular job doesn’t help that much in the long run. Contrast this to Final Fantasy V, which also uses the job system, but here you’re allowed to retain abilities from earlier jobs. It makes building up a particular occupation more rewarding. The Dragon Quest series also uses the job system, and it also has evolved over time. The first game in the series to use it is DQ3, where class changes must be done at the Shrine of Dhama (yeah, it’s spelled this way in the English translation, and I’ve never been able to figure out why), and you have to have reached at least Level 20 with your current job. Changing jobs means cutting your stats in half, but you are allowed to keep magic spells you’ve learned before. As such, you could make a character into, say, a soldier who can use magic. Later installments retain the shrine, with “Dharma” spelled correctly in Dragon Warrior VII, and newer translations changing the name to Alltrades Abbey. In DQ6 and 7, building up a job is different from leveling up, and your chosen trade affects your stats, but apparently not the equipment you can use. The main goal of taking on a new job is to learn new skills, both magical and otherwise, which you can then keep upon switching to another profession. Also, there are jobs that you can only take on after mastering two or more other classes. DQ9 has Alltrades Abbey and the job system as well, but I haven’t used it yet in my play-through of that one. I’m told it becomes more useful after beating Corvus, which I still haven’t managed to do. Anyway, I like games where you can build up your strength or skills, and the job system often provides a fun way to do just that. Perhaps it’s because I feel I’ve never gotten anywhere in real life, but I’ll leave that bit of amateur self-analysis aside for now. This entry was posted in Dragon Quest, Final Fantasy, Video Games and tagged alltrades abbey, crystal tower, dragon quest iii, dragon quest ix, dragon quest v, dragon quest vi, dragon quest vii, final fantasy iii, final fantasy v, magic spells, shrine of dharma. Bookmark the permalink.